Over on Tom Wark's blog Fermentation, he's been profiling wine bloggers. These posts give you a better sense of the bloggers behind the blogs that you might read, and the latest "Bloggerview" interview was with Ryan and Gabriella, the folks who bring you Catavino. Regular readers of the blog know that one of my new year's resolutions was to get to know Spanish wine, and I've done a pretty good job fulfilling my resolution so far--thanks to Catavino. My growing knowledge of the wines of the region has been largely the bi-product of their great reviews and writing. Recently, they hosted WBW #38 on Portuguese wines, and now I'm committed to learning more about them, too. Once again, Catavino to the rescue. They put together a 3-pack of recommended Portuguese wines for domaine547 and I popped the cork on my first bottle the other day. Drinking this wine was a great way to toast Catavino, their great taste in wine, and the help that they've given me this year as I learned about Iberian wine. Thanks, Ryan and Gabriella. Cheers to you! As we approach the hysteria that is Thanksgiving, it is always good to remind oneself and those you love that food and wine pairing is not rocket science. It should be a highly pleasurable process of trial and error that no one can really do for you because taste is a subjective thing. You may love pizza with chardonnay, even though this breaks almost every "food pairing rule" that I know. I don't; but you just might. If you still fee that wine and food pairing IS rocket science, there is a new company that wants to help you: Wine That Loves.... Their lineup of wines that love grilled meat, pizza, salmon, chicken, and pasta promise to solve your wine and food pairing dilemmas for all time--provided of course, that you are serving one of these dishes and can manage to master the eye-catching graphics that lead you to the right wine for tonight's dinner. Each wine has been carefully selected to pair with a certain food by a sommelier, and is priced at $12.99 to make it affordable for everyday drinking. Ralph Hersom, who has the distinction of being the former wine director for New York's Le Cirque 2000 restaurant, is the sommelier who figured out which wines would love which dishes. While this may cut some anxiety in the grocery store, I remain skeptical of this approach to something as marvelously fun and fabulously imperfect as wine and food pairing. Call me a cynic, but if you believe that a) wine pairing is not rocket science and b) part of the fun of wine is figuring out what combinations taste good to you then this lineup will actually keep you from learning about good wine and food pairings. I was not able to figure out what varieties of grape went into any of these wines, as it was not clear from the website or the labels, but I sure hope that they tell you on the back because otherwise how will you be able to apply the knowledge gained from knowing what wine loves pasta to the wine store, the restaurant, or your own kitchen after you pop the cork on one of these bottles? Taste is subjective. Celebrate your own unique taste buds. Drink red wine with fish. Break rules. Practice wine disobedience. Learn things. Do some wines taste better with certain foods? Absolutely. The search is on. Discover your wine and food bliss. And if you want a real education in these matters, check out Dr. Vino's periodic impossible food and wine pairing challenges. They are wonderful evidence that there is no perfect food and and wine pairing--except for your tastebuds. It's been a while since two of my favorite WBW themes: biodynamic wines (hosted by Jack and Joanne at Fork and Bottle) and value wines from Languedoc- Roussillon (hosted by Dr. Weingolb). Months later, I still find myself on the lookout for biodynamic and Languedoc-Roussillon bottlings, which is the true sign of a successful WBW, in my opinion. Other bloggers sometimes call these the "ghosts of WBWs past," because they, too, find themselves going back and reading the roundups and following up on some of the great reviews and finds that fellow bloggers bring out in the open. Just in time for Halloween I had one of these ghostly WBW experiences. The 2003 Domaine Olivier Pithon Cotes du Roussillon Villages "Saturne" managed to cover two WBW themes in one bottle, since it's a biodynamic wine from the Cotes du Roussillon ($19.50, Red Carpet Wine Shop; available from other merchants for between $20 and $30). Like many wines from the south of France, this Pithon bottling was made from a blend of grenache, carignan, and syrah and had a deep, inky purple color. Either because it was made biodynamically or because it was from the Languedoc-Roussillon, I didn't find it was as aromatic as a Rhone wine made with these varietals. Still, there was loads of plummy fruit and some anise on the palate with a decided streak of minerality. This is what I associate most with biodynamic wines: a long mineral note that extends from the aromas through the last drops in the glass and beyond. Good QPR, especially for the price that I paid for it, though I would have liked it to have a little more balance between the fruit and the mineral notes. If you are not living in LA (where it was 92 yesterday) then you may be thinking about stews, and this wine would be a good match with beef stew, or a roast chicken that sat in the oven just long enough to warm and perfume your house. This wine has been positively reviewed recently by the LA Times, where it was included in a list of chic and affordable wines. Domaine Olivier Pithon has an excellent website, where you can learn more about their biodynamic farming practices and their line of wines, so I encourage you to head over there to learn more if you are interested. 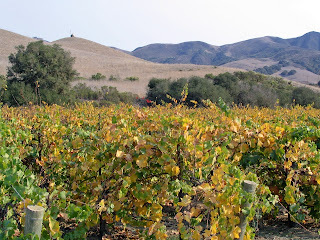 October in the Santa Barbara Wine Country: the El Jabali Vineyard at the Sanford's Alma Rosa Winery. Sorry for the lapse in posting. I've been in Santa Barbara tasting wine and visiting vineyards. I'll catch you up on all the news, soon! Sometimes you want a big wine, a wine that' s bold and brash and practically a meal in itself with chewy tannins and lots of body. But sometimes you want something light, lean, and fresh. I call these "spa wines," wines that seem to refresh you and clear the cobwebs out of your palate as much as a day at the spa. I often find myself drawn to this kind of wine after a long day at work, or if I've been drinking too many brawny reds and eating too much steak. 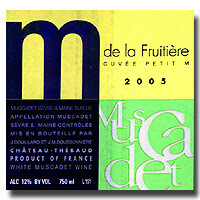 A wine that certainly qualifies as a "spa wine" in my book is the 2005 Domaine de la Fruitière Muscadet de Sèvre-et-Maine Sur Lie Cuvée Petit M. ($8.95, Chronicle Wine Cellar; available elsewhere for between $8 and $10) This wine had delicate fresh lime and mineral aromas, which conjured up images of citrus trees and walks on the beach. When you sipped the wine, it had light and lean lime, grapefruit, and stone flavors. This muscadet was lithe and supple like a yoga class, not heavy and muscular. This was not a terribly complex muscadet, but is was delicious, and at under $10 it certainly represented very good QPR. With such a light wine, I certainly didn't want to weigh it down with heavy or rich food. This wine screams out for shellfish or fish. While it is a brilliant pairing for something as light and lean as it is, it could handle something a bit more decadent, too. We had it with an Asian salmon rice bowl with lots of lime and some tangy cucumbers and it was lovely. But the last bit of the wine was just as good with a decadent Nigella Lawson shrimp and mango curry with coconut milk. This is in her new book, Nigella Express, which is due out next week (Oct. 30) here in the US. I scored a copy in England last month, and can testify that the curry recipe is worth the price of the book. Not precisely spa food, with all that coconut milk, but awfully good nonetheless. Wine and Your PDA: A Price Revolution? I've never done this, nor have I ever seen it done, but I can imagine that it is going to happen with greater frequency now that everyone's running out and getting each new Apple contraption available. The question is, will restaurant markups shrink now that consumers can easily check on how much the wine would cost around the corner at Joe's Wine Shop? And will they choose differently based on consumer reviews on sites like CellarTracker and Snooth? And what about Joe's Wine Shop? Now that buyers can stand in the aisle and check to see if they can find the wine at Joe's for less somewhere else (read: giant chain store), will we end up with greater homogeneity in wine prices? More importantly, will we end up with fewer small retailers, since they will find it more difficult to compete with the box and chain stores? I'd like to hear what people think about this trend. Do you routinely use your PDA or phone to check wine prices when you're out in restaurants or stores? If not, would you like to someday be able to do just that? What do you think the upside and the downside of this is for winemakers, retailers, and consumers? If you think there is something weird about blending red and white wine, think again. As I've mentioned before on GWU$20, I love the mixture of shiraz or syrah and viognier that produces wines that have all of syrah's spiciness, but with floral aromas and a silky quality. And I'm not the only one to like wines that are red, white, and tasty all over. Gary Vaynerchuk is a big fan, too, and you can watch him tasting a few shiraz-viognier wines over at Wine Library TV. When you open this wine you might be taken aback by the smell of apricots along with spicy red fruit. But you'll find that the flavors are more familiar to red wine lovers, and are based on the varietal characteristics of shiraz and grenache: blackberry, red raspberry, and peppery spice. All of these flavors are wrapped up in a silky package, with the viognier bringing not only enticing apricot aromas but a nice lift to the wine when you hold it in your mouth. The flavors weren't hugely persistent, as they are with many Australian shirazes, but the wine is so bright and lively that I found it irresistible nonetheless. Very good QPR at under $15, and even if you have to pay more I suspect you will agree. What to have with your red-white wine? Thai beef curry, a spicy beef stir-fry, or even a bowl of chili would be perfect. I should note that some of Maxwell's Four Roads from the 2002 vintage were bottled under Stelvin closures and some under cork; my bottle was under a cork. If anyone has has the screw-top bottle, I would be interested to know if you found the viognier even more apparent in either the aromas or flavors. But under screw top or cork, I think you will really enjoy this tasty and affordable red wine from Down Under. Weekend Wine Shopping: WBW Made Me Do It! Wine Blogging Wednesday. It's good news and it's bad news. Good news because we learn a lot about wine. Bad news because, once we learn about it, we want to drink it. So this weekend's wine shopping is dedicated to helping you find the wines to either feed the need for Portuguese vino that was caused by reading all those fabulous tasting notes that Ryan and Gabriella drew together from WBW #38, or to feed the need for Burgundy wines in preparation for Neil the Brooklynguy's WBW #39 in November. After I had my bottle of Portuguese white, I knew I wanted to taste more Portuguese wine. So I clicked over to domaine547, my favorite armchair wine store, and bought one of the new "wine blogger packs." This is a new idea at domaine547, where wine bloggers select a few wines that they think that their readers would like to try. The first pack was put together by Catavino's own Ryan and Gabriella, and included three carefully selected Portuguese wine. The price? $50. 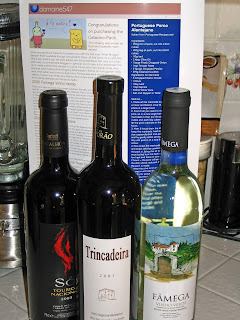 The Catavino Pack contained a zesty 2006 Famega Vinho Verde; a hearty 2003 Esporao Trincadeira; and a 2003 Bacalhoa Touriga So. Opening the box was a bit like opening a present--there was a great information sheet (which included the recipe for a perfect food pairing for the Trincadeira!) and a little gift (a much snazzier foil cutter than the one I presently own). I'm happy to have my three bottles of Portuguese wine, and to have reduced the sizable carbon footprint I planted on LA in the past few weeks trying to find wine for WBW #38! Are you going to someone's house for Thanksgiving? This would be a great "send ahead" hostess gift! I'd sure be happy to have this arrive at my house before the guests, and I might even save a bottle for you to drink with me. With WBW #39 looming, and Turkey Day on the horizon, I headed to Chronicle Wine Cellar to see if I could find some burgundy that would fit Neil's brief. I'm in a comfortable rut drinking my Girardin second labels, but Neil suggested I try something else and happily Chronicle has a great selection of white burgundies right now. I scored a 2004 Domaine Larochette-Manciat Pouilly-Vinzelles Les Longeays ($15.95). They also had a Pouilly-Fuisse from this maker for under $20, a Girardin Rully for $24.95, and some other scrumptious looking white burgundies from the Cote de Beaune. When I was there Elizabeth was also packing some Portuguese reds (go figure...), including the 2004 Symington Altano made with Tinta Roriz and Tourgia Franca grapes ($6.95). They still have bottles of affordable and tasty Cono Sur wines on the shelves, too. Jerry Hall of Winewaves likes these Chilean pinots, so they're worth a try considering they are under $10 at Chronicle. We're entering into the part of the calendar that I call "The Crazies." Beat the crowds and calm the hysteria by getting a few nice bottles into your house now. With these bottles safely in my possession, I can think about sipping Trincadeira Halloween night, and finding a good chicken dish to have with that Pouilly-Vinzelles. Here at GWU$20 I use varietal characteristics to evaluate wine. I want my cabs to taste like cabs, and my chardonnay to taste like chardonnay. Drinking a wine that says it's one thing on the bottle, and then tastes like something else, seems like wine identity theft. It can also make it impossible to evaluate the wine's quality-to-price ratio on a consistent basis. The market price for cabernet and gamay are different; so if I have a cab that drinks like a gamay, and paid $18 for it--well, I am not happy. If I wanted gamay, I'd buy it for $13 and enjoy every drop. I've had a run of wines that were made from one grape, but drank like wines made from another. Is it wine identity theft, or is something more complicated going on? The first was a 2005 Eaglepoint Ranch Grenache ($15 from most merchants) that came from the cool Anderson Valley in Mendocino County. This smelled exactly like grenache, but it tasted like a gamay wine from the Beaujolais. Aromas of herbs, plums, and blackberries started things off, which are some of the aromas I associate with grenache, along with a floral note. The flavors were much lighter, however, with strawberry at the core of its flavors, and some mineral freshness as well. I really liked this wine because it was a nice, light red. But if you pick a bottle up at the wine store, I'd recommend treating it as you would a beaujolais, not a French grenache. 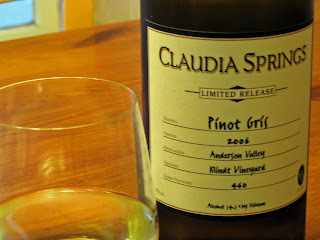 The second wine that seemed like a victim of identity theft was the 2006 Claudia Springs Pinot Gris Klindt Vineyard ($17). Pinot Gris is known for its apple and lemon flavors, and I always associate the wine with crispness and a bit of round vanilla from the time that it sees in oak. 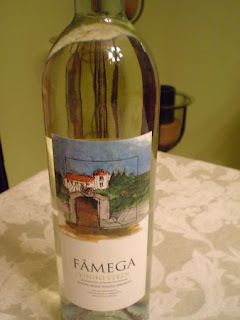 This wine was pale straw in color, and had very muted aromas of apples, apricots, and cream. Apricot and apple dominated the flavors, and as you swallowed the last drops you tasted even more butter and cream. This was a pinot gris that would appeal to chardonnay lovers. It may be that the juice underwent malolactic fermentation which is not common for pinot gris. This would account for the creaminess in the flavors and aromas, but I couldn't find out for sure if this was the case or not. 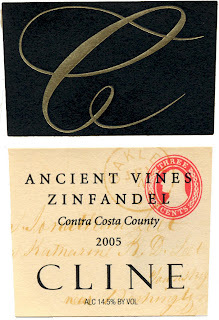 My third case of wine identity theft was the 2005 Cline Vineyards Ancient Vines Zinfandel (between $11 and $20). A bright ruby-red zinfandel, this had lots of herbal aromas up front and not much fruit. Flavors of herbs and minerals put the blackberry fruit flavors that were present as well into a secondary role in this wine. It had a tangy, herbal finish that reminded me of a cabernet franc. We didn't drink the whole bottle the first day, and it actually seemed a little more fruity and peppery, and therefore more characteristic of the varietal, on the second day. This made me wonder if the wine needed some more time in the bottle to really shine. While these wines were hard to evaluate from a QPR standpoint, I enjoyed drinking each of them--as long as I covered up the label! There was nothing wrong or flawed with the wines. I was just surprised at the way that they tasted. But there may be reasons for the flavors that these wines exhibited. 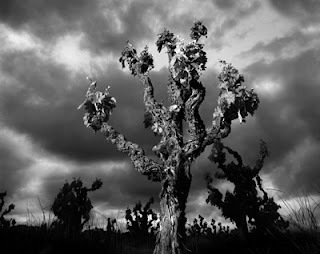 The grenache was grown in an unusual place: the relatively cold climate of the Anderson Valley. Grenache is most often associated with the south of France. Perhaps that accounted in part for its Beaujolais-like qualities? The second wine may have gone through an unusual fermentation process for the grape, which made it creamier than most pinot gris. And the zinfandel might have been too young to really strut its stuff. Before you call out the wine police for your next case of wine identity theft, consider the unique growing, winemaking, and aging needs of your wine. Varietal characteristics are an important part of the story--but they aren't the whole story. And sometimes a wine identity thief can be a pleasant surprise. Decanter magazine reported that Australia's Yalumba Winery has decided to bring order to chaos in wine labeling by precisely setting out in an "Old Vine Charter" what counts as an "old" vine, what counts as an "antique" or "very old" vine, and what counts as an "exceptionally old" vine. 35 years of growth is all it takes to be "old." Antique, I am happy to report, is 70 years old or more. And "exceptionally old" vines are 100+ years old. What that means is that most reading this blog are old in vine-years. Or they soon will be. When I pick up a bottle that says "Old Vine" I tend to see it as a marketing strategy, which is all the more reason to applaud Yalumba Vineyards for trying to set some standards in the industry. If "old vine" is to mean anything more than just a marketing pitch, it has to signify something. At Alderbrook in the US, for instance, "old vine" means a vine that has been in use for at least 40 years. At Seghesio, all "old vine" wines are made from fruit that comes from vines that are at least 60 years old. Dry Creek "old vine" zinfandels are made with fruit from 50-100 year old vines. I suppose that a "middle-aged vine" designation is neither likely nor desirable. But with this range of opinion on what constitutes "old" I think the buyer should beware. Your "old vine" wine may be younger than you are! I've got two news items from the Wine Blogging Wednesday front to report today. The first is that our hosts from this month's WBW #38 on Portuguese Table Wines, Ryan and Gabriella of Catavino, have posted a marvelous round-up of all the submissions they received. It includes a map so you can orient yourself among the Portuguese wine regions, and regional lists of the wines that were tasted with links to the reviews themselves. 34 bloggers and 2 non-bloggers provided us with 62 tasting notes, so it is a terrific resource if you want to find out more about Portuguese wines. After cruising the excellent reviews posted by fellow bloggers--and non bloggers--I think the overwhelming response was one of surprise at the quality of the wine given the price. I also think that most of us made appeals to distributors to make it easier to find Portuguese wines in our local stores, given how hard it could be to find one of these bottlings. So thanks once again to Ryan and Gabriella for hosting such a great event. Now that WBW #38 has been wrapped up, it's time to start preparing for WBW #39. Next month's event will be hosted by Neil, the Brooklynguy who loves wine. The theme is "Silver Coast" Burgundies, which tend to be a little less pricey than their Cote d'Or neighbors but are wonderful wines to drink and get to know Burgundy a bit better. Neil provides lots of information about how to identify wines from the Maconnais and the Cote Chalonnaise on his website, and asks you to submit your tasting notes to him by Wednesday, November 14. Bonarda is a mysterious grape. It is the second most cultivated red wine in Argentina, but its origins lie in Italy. It was brought to Argentina by Italian immigrants in the 19th century. And viticulturalists still aren't sure whether the bonarda grown in Argentina is actually bonarda or charbono. No matter what the DNA tests eventually prove, this is a grape variety that produces low tannin, food-friendly wine. And if you can find an Argentinian bonarda, it is usually a wine that you can buy for a great price, too. 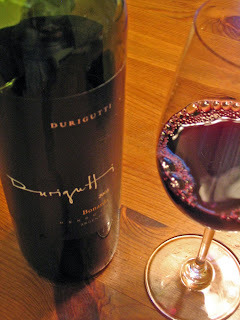 The 2005 Durigutti Bonarda certainly fit this profile: it was a great food wine at a terrific price. ($7.95, Chronicle Wine Cellar; $7-$10 from other merchants) It was a beautifully deep eggplant in color,which underscored its Italian roots for me. It had luscious aromas of blueberries, leather, and plums, which was a nice blend of the Italian and the Argentinian. There were low levels of tannin, and lots of silky blueberry and plum flavors, once the wine was in your mouth. I caught a bit of minerals in the finish, which kept the wine tasting clean and brisk. This was a slam dunk in the QPR department: excellent QPR. We had our bonarda with a suitably Italian autumn meal: Jamie Oliver's tomato-based minestrone that was made with seasonal early autumn vegetables from the farmer's market. (hint: using dried or fresh beans really makes a difference, so buy some dried beans and soak them overnight before you make the soup. They will be far less mushy than the canned variety.) A hunk of rosemary bread, some flavorful cambazola cheese, and we had a satisfying meal that went together just beautifully. Most important, the tomatoes didn't clash with the tannin levels in the wine. This is a wonderful fall red, as good with your last of the summer barbeques as it would be with soups, stews, and pastas. You may not be familiar with the grape, but once you've had it my guess is that you will be actively looking for wines made with bonarda on the wine store shelves. Tucked into the hills just off Highway 128 in Mendocino County is a winery that produces cult wines for the common person. Navarro Vineyards is something of a cult favorite among people like you and me--folks who like fine wine, who appreciate when wine reflects the place where the grapes are grown and the varieties that go into it, and who don't want to spend an absolute fortune to drink it. Thanks to Ted Bennett and his partner in life and work, Deborah Cahn, it's been possible for ordinary people to drink extraordinary wine ever since they started Navarro Vineyards in 1974. When Ted and Deborah began working the land and planting their vineyards, vineyards were few and far between in the Anderson Valley. 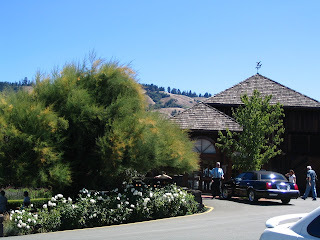 They took over a former sheep ranch, and planted unfashionable varieties for the time, such as pinot noir, gewurztraminer, pinot gris, chardonnay, muscat blanc, and riesling. If this makes you think "Alsace," there is a reason. Ted and Deborah love the wines of that region, and they are perfectly suited to the Anderson Valley's soil and climate. Critics agree. The wines are regularly praised by Dan Berger, who frequently includes specific bottlings in the recommendations he makes for exciting and high value wines in Tom Stevenson's annual Wine Report (ps., the new edition is just released, so you may want to pick up the 2008 Wine Report now). Navarro Vineyards devotees are usually members of the Pre-Release Club, which delivers a personal stash of Navarro wines to you each June and December at 10-33% discounts. The friends I visited the vineyard with late this summer are members of the club, and were able to pick up some of their wines while they were there. They were even kind enough to share a bottle of Navarro's special pinot noir, the Deep-End Blend, with me over dinner after our day out in the Anderson Valley. Below you will find my tasting notes for the wines I tasted recently at the vineyard. Prices indicated here are the suggested retail prices at the winery; as always the price you pay may be higher or lower at your local merchant. Clicking on a wine's name takes you either to a list of merchants who stock the wine, or to Navarro's online store where you can order what you want and have them shipped directly to you as long as your state allows it. Navarro wines can be hard to find in retail stores, because Ted and Deborah prefer to keep their prices low, cut out the middle-men and middle-women, and sell directly to their customers. With wine this good, and prices this reasonable, who can argue with their plan? 2005 Navarro Vineyards Pinot Noir ($18) I promised you I would tell you when I found a really good pinot noir under $20. I found it, and I'm telling you, this is excellent QPR. Rose aromas and juicy black cherry fruit usher you into the equally juice cherry flavors. 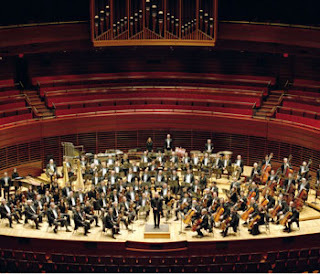 There is medium toast on the mid-palate and a good balance already for a young wine between fruit, spice, and acidity. Not as complex as the Methode a l'Ancienne pinot noir, but a great deal for the price. 2004 Navarro Vineyards Pinot Noir "Méthode à l'Ancienne" ($25-$35) Really impressed with this year's bottling. I tasted nuts and earth, along with mushroomy and truffley notes, that accent the core of bright acidity and cherry fruit. I think it will age very, very nicely. Excellent QPR. 2005 Navarro Vineyards Navarrouge ($12) Eight red varietals, including syrah, cabernet, pinot noir, and carignan go into this excellent QPR wine that should be a leading contender for your house red. Cherry blossom aromas, black cherry flavors with a fair amount of oak in the midpalate, but it's interesting and flavorful. I suspect it will be even better in 4-8 months. This is one to buy by the case and just have on hand for when friends drop by at the holidays. 2006 Navarro Vineyards Edelzwicker ($12). A lovely wine for the money, made from riesling, gewurztraminer, and pinot gris grapes. Enticing flower aromas, with a palate of litchi and lime. Our favorite wine to have with Thanksgiving leftovers, or for any holiday lunch, don't be surprised when this turns up on my holiday wine picks this year. Excellent QPR. 2005 Navarro Vineyards Muscat Estate Bottled Dry (around $18 if you can find it). This is a wild, wild wine with pure orange blossom aromas and a searingly crisp and dry lemony palate and finish. Very clean wine, and schizophrenic in a good way--or at least a way that works! Perfect for sushi with wasabi. Very good QPR. 2004 Navarro Vineyards Syrah ($22) Huckleberry and cranberry dominate the fruity notes in this syrah. Good acidity, but I would prefer to taste more spice. I think this wine will continue to develop, though. Good QPR. 2005 Navarro Vineyards Pinot Noir Deep End Blend (price N/A). This wine has a lot of potential and is already drinking beautifully. High-toned cherry and cinnamon on first opening, with a dark ruby color. As it opens up notes of cedar, cocoa powder, and blackberry enter into the palate and aromas. Continued to develop and gain complexity as we drained the bottle. Wait a year and check again, but I think this one will age well and develop in interesting ways. This will be expensive if you can get it (as in more than $40), but it is an awfully complex pinot and good QPR. 2003 Navarro Vineyards Riesling ($18-$19). Very good dry riesling with apple and apricot fruit and a little tropical fruit lift in the midpalate. This resembles a German kabinett, but lacks the mineral dimension to make it outstanding. Good QPR. 2006 Navarro Vineyards Pinot Noir Deep End Blend (Barrel sample; not yet released). Beautiful color and pinot texture on this wine, with rich cherry flavors and nice cedary notes underneath with some earth, mushroom, and thyme. Lots of acidity now, giving the wine the structure that promises great things to come. Will be more than $40 if you can get it, but in time it is likely to be worth every penny. Good QPR. 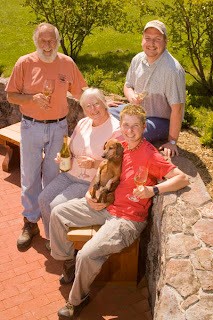 Navarro Vineyards has a great website, with detailed information on every wine that they make. They also answer their email, so if you have a question or want to check to see if they have any bottles of that dry muscat hanging around, don't hesitate to drop them a line or give them a call. If you are a Navarro fan, feel free to leave notes about your own favorites in the comments below. It's that time again: Wine Blogging Wednesday. Today, bloggers all over the world will be telling us what they tasted when they uncorked bottles of Portuguese table wines. Ryan and Gabriella at Catavino cooked up the theme for WBW #38, and asked us to look for Portuguese wines that were not the fortified port wines most of us associate with the region. Portugal makes beautiful table wines, too, and they challenged us to look beyond the popular Douro region, and beyond the familiar Mateus and vinhho verde to look for something new and different to taste our palate. I succeeded in steering clear of the Mateus, and the vinho verde, but I did end up with a pick from the Douro. It turned out to be oddly challenging to find a Portuguese wine in LA, and the best selections were often in chain shops, like Beverages & More. But I did find a bottle--a white, no less--at a local store and it impressed me enough to wonder why more merchants don't stock wines from this region. If they are anything like this one, they are good, affordable food wines. My pick for WBW #38 was the 2005 Adriano Ramos Pinto, a white wine made by an old wine house that specialized in port founded in 1880 by the man whose full name is on this wine: Adriano Ramos Pinto. ($10.99, Mission Wines; available from other merchants for between $10 and $13). The wine is blended from three varieties of grape: Viozinho (60%), a low-yielding white variety used in white port; another low-yielding white variety, Rabigato (30%); and Arinto (10%), a white variety that brings acidity to the mix and is used in making vinho verde. I've never tasted anything made with any of these grapes, so I wasn't sure what I was in for. Turns out that this white blend resembled an aromatic, bone-dry riesling or a medium-bodied, barely oaked sauvignon blanc. There were soft aromas of grapefruit, citrus pith, and a whiff of petrol when you first opened it--just like a riesling. These appealing smells led into the flavor palate, where clean grapefruit and mineral notes met up at the back of your throat with a whiff more petrol. At 12.5% alc/vol. it was a very pleasant food wine, all the more so because it was very lightly oaked. The wine was aged for only six months, with 80% of the juice spending its time in steel vats, and 20% of the juice spending its time in new French oak. Given its low price, and its interesting mix of aromatics and dry flavors, I thought this wine represented very good QPR. This wine would be an excellent pairing with not-terribly-spicy Indian or Asian food, richer fish dishes, light chickendishes, and salads. We had it with Indian-spiced Bombay Sliders, mini chicken burgers with lots of aromatic spices and herbs in them. These were popped onto dinner rolls, topped with some curried mayonnaise, and some sliced veggies. We had oven-fries made with sweet potatoes along side. The wine really went well with this range of flavors and ingredients, and would have been a particularly good option for those who don't like the sweet impression that rieslings (even dry rieslings) give. While finding the wine was a challenge, I'm glad I did locate a Portuguese table wine--and a white, no less. I'm going to keep looking for wines from this region, and try to learn some more about the grape varieties. This wine was a real surprise, and I think I'm missing a lot of interesting wine. Thanks to Ryan and Gabriella for the great theme, and as always thanks to Lenn Thompson of Lenndevours for dreaming the event up more than three years ago. 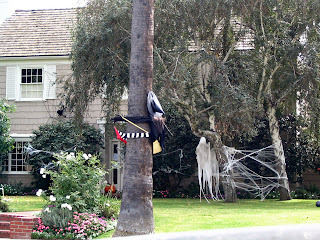 I'll post the link to the roundup when it is available, as well as a link to November's theme. Hey, readers! We did it. Thanks to your many outclicks to Wine Spectator to check out Amy and Peter's Hocus Pocus video, "A Toast to the Little Guys," they WON. (Still from the video from Wine Spectator). Seriously, it probably wasn't all due to GWU$20 readers, but I happen to know that many of you did at least take a peek at it. It was a good video, and a great glimpse into the "glamorous" world of wine. Which is why I find it so weird that 85% of any grape variety is enough to warrant slapping "sauvignon blanc" or "cabernet sauvignon" on a label. Do people think this makes me MORE likely to buy the wine? It turns out it makes me LESS interested. Am I alone in loving blended wines like Sauvignon Blanc and Viognier, Grenache with Shiraz and Mourvedre, or Roussanne and Marsanne? Is this labeling practice a weird hangover from when purchasers were scared--rightfully so--of everything-but-the-kitchen-sink blends? Do we still think that just because a wine includes a single variety of grape or the juice comes from only one vineyard, it's a better wine? Sometimes, this is true. But certainly not always, as anyone who drinks Rhone blends, Bordeaux blends, or some of the excellent blends coming out of California or Australia knows all too well. I've been thinking about this a lot lately because of a recent dispute on CellarTracker! that had to do with labeling a wine as the varietal "Fume Blanc." I thought the varietal was sauvignon blanc, and the style off wine was fume blanc. Turns out our friends at the ATF recognize fume blanc as a synonym for sauvignon blanc. Weird, but hard to argue with even though I passionately believe that this just confuses consumers and is wrong, wrong, wrong. Then I argued that the wine had 88% sauvignon blanc and 12% viognier and should be labeled a white blend. Foiled again, since as long as there is 85% or more of a single varietal it counts as a single varietal wine. This goes against everything I believe about promoting the widest possible number of grape varieties, and telling people exactly what is in the wine they are drinking. How will people learn about viognier if they don't even know that they're drinking it? I don't need calorie counts or carbohydrates on my wine labels. I just want to know what grapes went into it! This week it seems only right to focus a bit on Iberian wines, with WBW #38 coming up on Wednesday featuring Portuguese table wines. Today, however, I'm going to review an excellent tempranillo that I tasted recently. It came from Bodegas Arzuaga, a winery in Valladolid that also has its own hotel in case you are interested in wine travel. A vacation in Valladolid sounds pretty good to me right now, I must say. 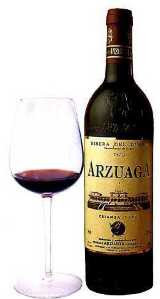 The 2003 Bodegas Arzuaga Ribera Del Duero Crianza may be the best tempranillo I've ever had. ($12.99/375ml, Chronicle Wine Cellar; available from other merchants for between $15 and $27 depending on bottle size) I looked through my notes, and haven't found one that seems to beat the high praise I had for this bottle of inky, plum-colored wine. The rich plum colors beautifully foreshadowed the deeply plummy aromas and flavors that followed. But there was a lot more than just plumminess. In the aromas, I detected scents of grilled meat and pepper, too. And in the flavors I tasted not only plum but blueberry, spice, and pepper with a caramelized brown sugar note as you headed towards the finish line. There was a lot going on in this wine, yet it was still very drinkable and went well with food, specifically an orzo salad that riffed on the theme of paella with lots of peppers, chorizo, and other yummy ingredients. (note: the leftovers made a pretty spectacular lunch the next day). While this wine was a bit more than most tempranillo I buy and drink, it was also a lot more complex, so I still consider this to be a very good QPR choice if you see it in the wine store. I'd definitely buy again. And speaking of buying wine, if you haven't done so already head out tomorrow and buy a bottle of Portuguese table wine--not port!--and join our hosts Ryan and Gabriella of Catavino on Wednesday for WBW #38. Last year, I needed to learn blogging software and decided to write up some wine shopping experiences. 365 days, over 63K visitors, and 450+ daily subscribers later, I'm amazed that the blog continues to grow and change. I would like to specifically thank Neil the Brooklynguy, who left the first ever comment on the blog (responding to a tasting note for a 2005 beaujolais, of course! ); Tom Wark, who was the first "big blogger" to notice and promote the blog leading to a significant spike in circulation and a lot of new perspectives in the comments section; Tyler Colman, the best of the best in wine blogs, who also noticed the blog and mentioned it in print; Andrew Barrow, who selected it for inclusion on his expert's list at BlogBridge; the other ladies who regularly write about wine in the blogosphere (Amy, Catie, the other Deb, Elsbeth, Farley, Gabriella, Jill, Sonadora, Mary, and now the Wine Scamp) who are a constant source of inspiration and also provide much-needed reality checks when the blogosphere gets a little weird; and my Twitter friends who bring much humor and diversion to each and every day. I would also like to thank the many winemakers and vineyard owners who have invited me to their wineries, given me tours and information, kept me up-to-date with press releases, and sent me sample wines. The fact that you recognize and appreciate the work that bloggers are doing to bring wine information to a larger audience is wonderful and keeps me working hard here at GWU$20 to warrant your interest in the blogosphere. Most of all, though, I'd like to thank anyone reading this for simply reading this! Blogging has become a fantastic addition to my life and the reason why is YOU. Thanks for trusting me to tell you what I think about the wine I'm drinking, the books and articles I'm reading, and the people that I meet along the way. Here's to a second great year. It was also an educational day, because at Roederer Estate we were able to taste two sparkling multi-vintage wines bottled at the same time in two different formats: 750mls and magnums. Just a few days ago, Dr. Vino reported that a student asked whether the size of the bottle effected the wine inside. He wrote to Terry Thiese, the well-known importer of champagne, to see what he thought--and the answer was yes, it does make a difference! As you will see from the notes below, that was certainly our experience, too. 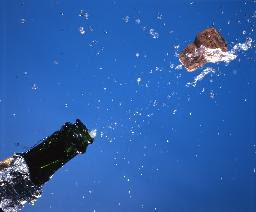 Enjoy, and here's hoping that you have something to celebrate soon that will cause you to bring out some bubbly. I've arranged them from excellent QPR to poor QPR, rather than alphabetically. M.V. Roederer Estate Brut (750ml from $15-$26; magnums from $39) Tasted in 750 ml and magnum bottles on same day. The 750ml bottle was very lively in the mouth, with aromas and flavors of yellow delicious apples, hazelnut, and toast. As with all Roederer sparklers we tasted, it had a creamy mousse and a fine bead. The magnum tasted very different due to longer time on the lees according to our tasting room staff, and the larger bottle size. It was much creamier and toastier, a very rich version of the brut in the smaller bottle with all the same flavor notes magnified and deepened. Excellent QPR, no matter what the size. But if you can get your hands on the magnum, it is a super wine, at a super price. M.V. Roederer Estate Extra Dry($22) I really liked this wine with its soft character. Aromas of brown sugar preceded a mouthful of toffee apple. Typical Roederer delicacy of bead and a nicely creamy mousse. Unquestionably very good QPR. 1997 Roederer Estate L'Ermitage Brut (750ml around $42; contact winery for more information, magnums available for around $89) Tasted in the magnum format. Just lovely--perhaps the best domestic sparkler I've ever had. Hay, apple, lemon, biscuit and mineral aromas and flavors. Super complexity with a tiny bead, creamy mousse, and a long lingering finish. Not cheap, but very French in style and substance. Undeniably pricey, but I felt like it was worth it. Very good QPR. 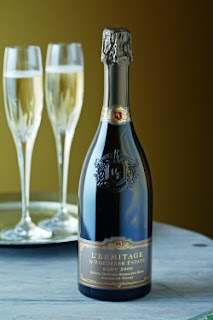 2000 Roederer Estate L'Ermitage Brut ($36-$40) A terrific sparkler made with complexity and finesse. Aromas of hay lead to a palate of creamy lemon, mineral and apple. Very nicely balanced, with small bead and creamy mousse. Pricey, but it delivers. I preferred the 1997, however. Very good QPR. M.V. Scharffenberger Crémant (around $20) I was pleasantly surprised by the quality of this wine. Yeasty nose with peach and citrus notes gives way to a dry, peachy palate. Would be very good with food. Good QPR. M.V. Scharffenberger Brut ($13-$22) Decent domestic sparkler, and worth the money if you want something simple and can get it for around $15—but I wouldn’t pay more than that for it. Aromas are more attractive than the palate, with red fruit and citrus. Vanilla cream notes enter into the flavors and I felt washed it out a bit. Short finish. Good QPR. M.V. Roederer Estate Brut Rosé ($21-$30) 60% Pinot and 40% chard make up this very pale salmon wine--so pale it is almost transclucent. Muted and delicate flavors of citrus and toast. I felt like there was something missing here, and had I spent more than $20 on this I would have been disappointed. Poor QPR. We're barely into fall, but I am finding myself drawn to reds in a big way these days. Cabernets, merlots, gamays--you name it, I'm drinking it as the days become shorter and the nights cooler. I also find myself pouring over soup recipes and looking for new ways to make stews, in my free-fall into autumn. Eric Asimov and his tasting panel friends supplied us with a nice list of red wines under $10 recently, and I wanted to add to the list for those of you who are still looking for good value red picks. One is under $10, one slightly over, but both are worth seeking out if you like classic reds. Even better, they represent an interesting excursion into Old World/New World red wine styles. 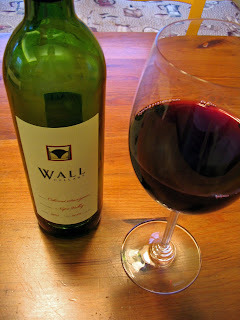 The first red pick I have for you is the 2005 Wall Cellars Cabernet Sauvignon from the Napa Valley. (I received this wine as a sample from domaine547, but you can get a bottle for just $13.99. If you buy it this week, it's only $11.89 according to the website). If you don't think you can possibly drink an excellent Napa cabernet for less than $40, think again. This wine had almost textbook varietal characteristics from its dark garnet color to its aromas of blackberry, black cherry, smoke, and a touch of green pepper. Flavors of black cherry and grilled herbs made this wine lively and fresh. Smooth tannins led to a peppery bite as you swallowed the wine, which left a pleasant, lingering aftertaste of herbs, berries, and spice. This was excellent QPR, considering the wine's complexity and its price tag. It was not as huge as many Napa cabernets, but in my opinion it was all the better for its restraint and its interesting mix of flavors. It reminded me much more of an Old World cabernet, than a New World cabernet. 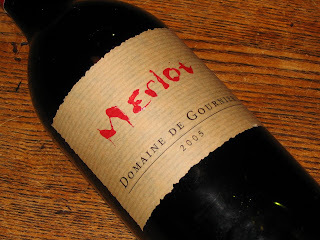 My second red pick is the 2005 Domaine de Gournier Merlot Vin de Pays de Cevennes, which comes from an appellation within the Rhone. (another sample from domaine547, available for $9.99). The Rhone is better known syrah and grenache, but this wine is proof that merlot can do very well there, too. This pleasant merlot was made from a merlot clone that is also planted at Chateau Petrus in Bordeaux. It had muted plum and mineral aromas that set the stage for flavors of dark plum and black cherry. Caramel and toast notes emerged as you held the wine in your mouth, along with some dusty tannins. We've gotten pretty jaded about merlot, what with the 90s and then Sideways, but they are awfully good food wines and this one is no exception. It was just as brilliant with arroz con pollo as it was with sausages and burgers cooked on the grill. This is a very nice and affordable example of an old world merlot that is a bit fruitier than most Old World merlots, but less jammy and velvety than those from the New World, and it also represented excellent QPR. If you're hankering after some more fall wine to drink now and lay down for the rest of the winter, you should consider these two options. They are so interesting, and so easy to pair with food, that they would make good "house red" candidates. Normally, I would hesitate to suggest a cabernet for this role, but in this case both it--and the merlot--would go with so many fall and winter dishes that I can put my normal cautions aside. After posting yesterday on dry white Bordeaux, I had to let you know that the single-serving wine juice box has hit France. What I want more information on, however, is the straw. They've put four holes in the bit of the straw that goes into your mouth and sealed the top that normally is the outlet for liquid. Supposedly, this special straw directs four separate streams of wine into the mouth, duplicating as closely as possible the mouth-filling effect of taking a sip of wine from a glass. Hmmm. Does that sound like how you drink wine? Ray Isle from the blog Tasting Room over at Food and Wine Magazine was asked to be on CNN to discuss Cordier's move to the juice box. Too bad they didn't get him one of those magic straws so he could test the technology out for us! Dare we hope someone has actually tried this wonder? I have to say sipping wine through a normal straw was one of the major problems with the Three Thieves Bandit Pinot Grigio I had for WBW #31. But really, I just have to wonder if this is ever going to catch on. Somehow, I doubt it. When most of us think of whites from Bordeaux, we think of the delicious Sauternes dessert wines made with a luscious blend of sauvignon blanc/semillon grapes that have been kissed by a touch of botrytis or "noble rot." But Bordeaux also makes dry white wines using the same mix of varietals. Because Sauternes gets most of the attention, dry whites from Bordeaux can be good value picks when you are in the wine store and are in the mood for something a little bit different with dinner. 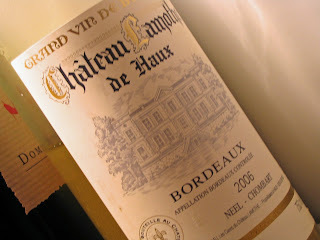 I picked up just such a dry Bordeaux white, and was pleasantly surprised by the 2006 Château Lamothe de Haux Blanc given its low price. ($10.95, Chronicle Wine Cellar; available from other merchants for between $10 and $11) The wine greeted you with fresh, juicy aromas of melon and citrus. These aromas were the perfect prelude to the flavors, which were also citrusy with round notes of melon. There was a touch of thyme as you finished the wine, which only added to the pleasure of this full and rich wine. I thought this was an excellent example of a dry sauvignon blanc/semillon blend, and had excellent QPR. We had the wine with a delicious grilled shrimp with an accompaniment of couscous salad. The shrimp were basted with a tarragon-flavored oil that picked up the nice herbal notes in the wine, and the shrimp seemed to pop with rich flavor just as the wine did. I should note that this wine would also be excellent with turkey--especially if you are going to serve some creamed onions with the meal, or sweet potatoes. So don't be surprised to find it in this year's Thanksgiving picks in a few weeks!